My recent research aims to test models of how the human frontal and parietal cortices interact with and control sensory and motor systems to support spatial cognition. My lab uses a variety of cognitive neuroscience techniques to provide convergent and complimentary evidence necessary to test, develop, and refine key theories. These include functional magnetic resonance imaging (fMRI), transcranial magnetic stimulation (TMS), magnetoencephalography (MEG), electro-corticography (ECOG), eye tracking, and psychophysics in both healthy and pathological populations. 1. My lab’s rallying cry is Space is the place! Most of our recent research has focused on the neural mechanisms that support spatial cognition, things like spatial memory, attention, and action planning. Admittedly, I’m drawn to space because of an intrinsic appreciation of the beauty and simplicity of geometry. However, my approach is also strategic in that one of the most general organizing principles of the brain is spatial topography. Our strategy is to use this organization as leverage to test theories of cognition. Our use of fMRI to measure population dynamics during spatial cognition is no accident. As a test-bed for answering questions about population coding, we use well-defined populations – retinotopic areas like V1, V2, IPS1, IPS2, etc. Each of these visual maps is well organized according to the topography of the retina. Each of these visual maps is composed of a few hundred MRI voxels, the unit of volume within which measurements can be made with fMRI. Each of these voxels contains about 60,000 neurons, most of which have similarly tuned spatial receptive fields (RFs). Most of our current work hinges on matching the scale of the brain signals that can be reliably measured to the topographic structure of neural populations that support spatial cognition. We think about populations, not single neurons, as the entity that encodes cognitive representations. As a field, we are limited by the methods we have available to make simultaneous recordings from populations of neurons. We take full advantage of the topographic organization of maps in both visual cortex and association cortex. With fMRI, we can make reliable measurements of neural activity in well-defined spatially tuned populations ideally suited for the models we use. Moreover, we can make simultaneous measurements in multiple topographically defined populations in the species we are trying to understand, the human. Unlike the vast majority of fMRI studies, where the goal is to localize in the brain the involvement of a function, we instead test theories about cognitive mechanisms within the test bed of spatial topographic visual maps. This allows us to go beyond asking where, and ask how. Arguably, all forms of higher-level cognition depend on our ability to create and maintain for short periods of time internal representations of information, a process known as working memory (WM; Curtis & D’Esposito, 2003a; Curtis & D’Esposito, 2004; Curtis, 2006; Curtis & Lee, 2010; Sreenivasan, Curtis, & D’Esposito, 2014). Over the last 15 years, my work has been instrumental in the development of critical theories as well as the use of fMRI, TMS, ECOG, and studies of patients with cortical resections to test a variety of hypotheses about the roles that the frontal, parietal, and even occipital cortex play in WM. Notably, we have identified several cortical retinotopic maps whose activity persists during WM retention intervals (Figure 1). Moreover, we have provided critical evidence that such persistent activities are memoranda specific (Schluppeck et al., 2006; Tark & Curtis, 2009; Saber et al., 2015; Rahmati et al., 2018), scale with memory delay duration (Srimal & Curtis, 2008), and correlate with memory fidelity (Curtis et al., 2004). Moreover, these studies have been influential in providing translational insights into the functional homologies between humans and non-human primates (Curtis & D’Esposito, 2003; 2004; 2009; Curtis, 2011) and have paved the way for collaborations with monkey neurophysiologists (e.g., Markowitz, Curtis, and Pesaran, 2015). Figure 1. Persistent activity during WM maintenance. Neural activity measured with fMRI persists throughout a WM delay in topographically defined visual areas in human frontal and parietal cortex (Jerde et al., 2012), and occipital cortex (Saber et al., 2015). In each area, following a transient response to the encoding of the visual target, activity remains above pre-trial baseline, and only resumes after the memory-guided response is made. Persistent activity is thought to provide a bridge across time linking past events with later contingent responses. My lab has made three other major contributions to the theories of the neural mechanisms of WM. First, we demonstrated that spatial WM shares a common mechanism with covert attention and oculomotor planning. Specifically, the multivoxel pattern of activity within the superior precentral sulcus (sPCS) and the intraparietal sulcus (IPS2) are essentially interchangeable when one maintains a location in WM, or covertly attends to a location, or plans a saccade to that location (Jerde et al., 2012). We argued that these areas, which are topographically organized, form a map of general prioritized space that can be maintained for WM, read-out by oculomotor areas for saccade planning, or read out by visual cortex as a means of biasing activity in favor of neurons with receptive fields that match the prioritized location (Ikkai & Curtis, 2011; Jerde & Curtis, 2011). Second, we demonstrated that even primary visual cortex contributes to WM functions and have been leading advocates of the sensory recruitment model of WM. As shown in Figure 1, neural activity as early as V1 persists during WM. In addition, in two studies we have demonstrated that this persistent activity is not the result of a lingering visual trace, V1 persistent activity is not “gated” by visual bottom-up stimulation as once thought, and the spatiotemporal dynamics of V1 population activity tracks the changing locus of memory (Saber et al., 2015; Rahmati et al., 2018) (Figure 2). Figure 2. During memory-guided prosaccades and antisaccades (top), activity as early as V1 persists in a spatially specific manner (Saber et al., 2015). Middle: Following the encoding of the visual stimulus, activity in voxels whose receptive fields (RFs) contain the visual target (green) persisted during prosaccade trial delays, but not in the voxels whose RFs were in the opposite visual field. During antisaccade delays, V1 activity first reflected the visual stimulus (red), then during the delay began to represent the goal of the antisaccade (green). Bottom: In a follow-up study (Rahmati et al., 2018), we used a basis set to model each voxel’s response to stimulation across the visual field. A weighted linear combination of all basis functions in all voxels in V1 was used to reconstruct a representation of visual space. Early in the trial, V1 population activity encoded the visual target location, but during the delay it began to reflect the goal of the saccade, regardless of whether it was retinally stimulated earlier in the trial. Third, the most dominant theory, based on electrophysiological and lesion evidence from non-human primate studies, posits that the dorsolateral prefrontal cortex (dlPFC) stores and maintains working memory (WM) representations. Yet, neuroimaging studies have consistently failed to translate these results to humans; our studies normally find that neural activity persists in the human precentral sulcus (PCS) during WM delays. We resolved this discrepancy by comparing the performance of patients with dlPFC lesions and neurologically healthy controls on a memory-guided saccade task that was used in the monkey studies to measure spatial WM. We found that dlPFC damage only impairs the accuracy of memory-guided saccades if the damage impacts the PCS; lesions to dorsolateral dlPFC that spare the PCS have no effect on WM (Mackey et al., 2016a). Moreover, we found that lesions to the human intraparietal sulcus also impair WM (Mackey et al., 2016b). These results identified the necessary subregion of the human frontal and parietal cortex for working memory. In a follow-up study, we applied TMS during the delay period to topographically defined portions of the frontal and parietal cortex and discovered that despite both being necessary for WM, they make distinct contributions (Mackey and Curtis, 2016). Figure 3. Lesion in PFC only impacted WM performance if the resection encroached upon the PCS (Mackey et al., 2016a). Patients with resections affecting retinotopic maps in parietal cortex, also have impaired spatial WM (Mackey et al., 2016b). In neurologically healthy subjects, TMS applied to retinotopically defined sPCS and IPS2 during the memory delay caused WM errors similar to that found in the patients with resections (Mackey & Curtis, 2016). Together, these studies provide causal evidence for the necessity of subregions of the frontal and parietal cortex. Voluntary control is necessary when an optimal motor response is uncertain or when a competing motor response must be overcome. A special case of voluntary control, or the more general term “executive” or “cognitive” control, is the ability to inhibit an unwanted action. We have tested computational models of oculomotor control by focusing on the presaccadic mechanisms that compete for selection. We have successfully used fMRI and eye tracking to measure signals in the human homolog of the monkey frontal eye field (FEF) related to the tug-of-war between drive and inhibition that ultimately predicts successful withholding of an unwanted saccade (Curtis & D’Esposito, 2003b; Curtis et al., 2005, Miller et al., 2005; Curtis & D’Esposito, 2006; Curtis & Connolly, 2008; Curtis, 2011). Moreover, we compared the effects of cortical resections of the putative human FEF on oculomotor behavior and found that FEF damage causes disturbances in the ability to plan and execute internally-driven saccades (Mackey et al., 2016a). Specifically, damage to the PCS (FEF homolog) results in a series of hypometric saccades that if given enough time finally results in an accurate position (Figure 4). Although this type of behavior is reminiscent of motor palsies caused by premotor cortex stroke, our interpretation focuses on the PCS’s role in providing spatial metrics to downstream saccade generators. 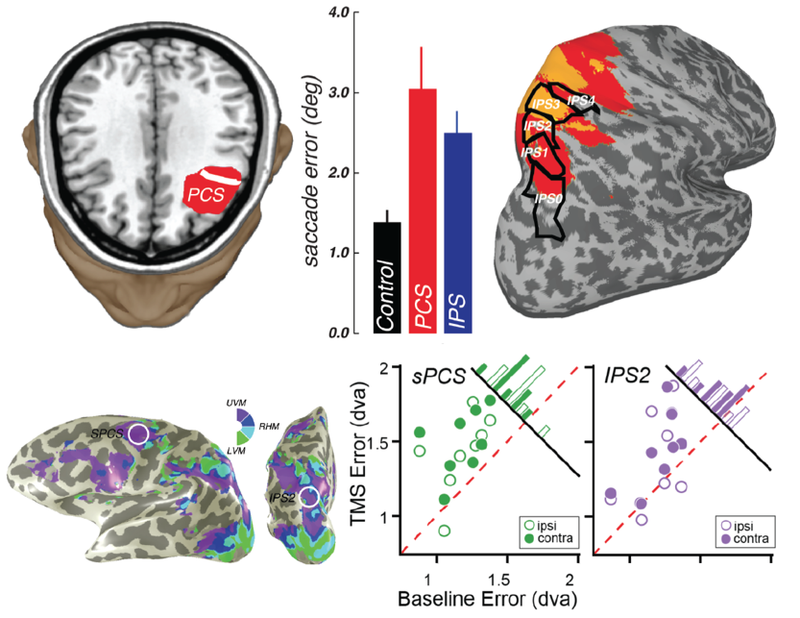 In this case, damage results in faulty metrics, which are corrected by misalignments between the retinal error following each saccade and the spatial goal simultaneously stored elsewhere (e.g., parietal cortex).